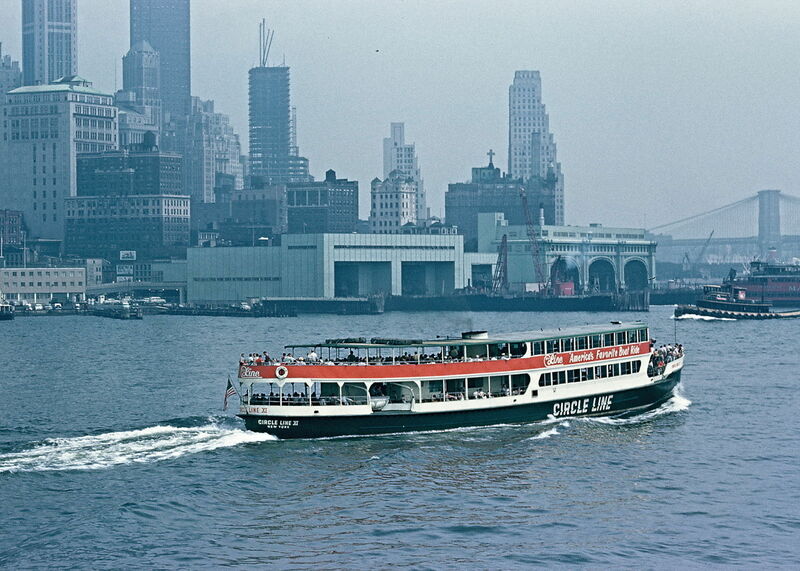 The Circle Line is one of many water routes to tour New York City. When little –- or big — people get tired out from sightseeing in New York City, it’s time to join a guided tour and let others do the hard work of navigating traffic, mass transit, and the city’s legendary general mayhem. And if it’s your first time visiting one of the most exciting and diverse cities for families with kids of any age, it’s also more relaxing to let a local expert guide you to the top sights. Fortunately, there are many tour options and most are quite affordable. We love to sail along the streets on a doubledecker sightseeing bus: climb up to the open-top level and take in the great views, get an orientation to the city’s distinct neighborhoods, and listen to a tour guide explain culture and history. The red buses of New York Sightseeing / Gray Line tours ply the streets of Manhattan frequently, and guests can hop on and off as much as they like; use them as handy transportation to choice destinations, or just sit back for the full-length ride. An “All Loops” ticket includes a Downtown Loop, Uptown Loop, Brooklyn Loop, a Bronx Loop and a Night/Holiday Lights Tour, plus a free one-hour bike rental for Central Park or the Brooklyn Bridge. If you’ve been curious about Brooklyn lately (home to hipsters, artisanal pickle-makers, and every living writer in New York it seems), try the Brooklyn Loop to get the lay of the land of this giant borough, starting with a fine view of the famous Brooklyn Bridge. Families may want to make stops to explore the 585-acre Prospect Park (which has seven playgrounds and a small zoo), or to visit the Botanical Gardens; the bus makes eight stops and your real-person tour guide can give advice. The bus for Gray Line’s Brooklyn loop leaves from City Hall from mid-morning until mid-afternoon: guests can take the Downtown Loop bus to get to City Hall. Visitors can buy Gray Line tickets online (with a discount), or at one of Gray Line’s eight Visitors Centers, or from one of the street agents who typically can be found at major tourist attractions (and who take major credit cards.) Note that tours with live guides are offered in 11 languages, and that the Bronx Look and the Night and Holiday Lights Tours are not hop-on, hop-off. Sample price for the 48-hour All Loops Tour is $54 for adults, $44 for kids age 3 to 11. Check the website for many different tour options and seasonal discounts. The famous red, green and white Circle Line (212/563-3200), whose ships make rambling, three-hour circumnavigations of Manhattan Island, is one of the picks in FTF’s New York City Attractions guide. However, the company also offers several other maritime tours including the Sightseeing Cruise and The Beast, all departing from their pier next to the Intrepid aircraft carrier museum at 12th Avenue, Hudson River and 43rd Street. For sightseeing in more than a New York minute, consider the budget alternative – the New York Water Taxi (212/742-1969 ), which departs from several piers as scheduled ferry-style service. They charge $30 per adult ($19 per child) for a one-day “hop-on, hop-off” pass or you can take one of their Harbor Tours. For a bargain, research the water taxis going to the Brooklyn outpost of the IKEA Furniture Store from the Manhattan piers, and you can hop aboard free of charge and see a bit of the Brooklyn Bridge. For a devout sightseer’s best value, consider their Four-Days Hop On Hop Off Fun ($69/adult and $48 child) which includes two days of water taxi use, and access to the Big Bus Company’s doubledecker bus tours for sightseeing (on land) within four of the five boroughs. Call ahead for current information or check the online schedule. If you find all the goings-on in New York City a bit overwhelming, contact Beyond Times Square (800/999-8160; 212/564-1001), for family-friendly walking tours of Manhattan, as well as the other boroughs, with guides who go beyond the typical tourist spots to give you an authentic Big Apple experience. Tours can be booked separately, or as part of packages that include lodging, theatre tickets, harbor cruises, etc. There is no better way to see the 42nd Street Times Square corridor than to get on New York Splash Tours, the first ever land and water visitor experience. Their AquaBus drives down 42nd Street, pauses for a multi-media experience of Henry Hudson’s journey with the sights and sounds of lightning and wind, then transforms into a boat and splashes into the Hudson River. This one-hour experience is great for the whole family, especially kids who are able to play a role as a sailor. This exploration runs from April through December, although at press time, host Star Line Tours had temporarily ceased offering it. Whether this is your first or fiftieth visit to New York City, the tours provided by Harlem Spirituals and New York Visions Travel Group (800/660-2166; 212/391-0900) are well worth signing up for. Celebrating its 25th anniversary this year, the company has been providing unique itineraries of cultural value in five languages, to visitors from around the world. If you’ve already seen the highlights of midtown and downtown, or if you just yearn for some ethnic flavor, contact Harlem Spirituals to learn about their wide variety of offerings including a Harlem Gospel Tour of several Harlem landmarks including a church service and inspiring gospel concert, or sign up for a Jazz Tour and see the sites of the original Cotton Club and Savoy Ballroom, and attend a jam session or swing dance event. All of these events include the option of a meal at the legendary Sylvia’s soul food restaurant. Additionally, culture, cuisine and people-focused tours are offered in other historical, multi-ethnic neighborhoods such as the Lower East Side in Manhattan (with a nosh at Katz’s Deli); Brooklyn Heights, Williamsburg and the Russian enclave of Brighton Beach in Brooklyn; and the Grand Concourse, Bronx’s Little Italy, the Bronx Zoo and Yankee Stadium in the Bronx. Comfortable buses and vans accommodating groups of all sizes depart from their headquarters at 690 8th Avenue (between 43rd and 44th Streets).